You will love this luxurious true custom Craftsman-style home. Wake up each morning and fall asleep each night to tranquility and nature, courtesy of the beautiful forest of hardwoods that back up to this home. 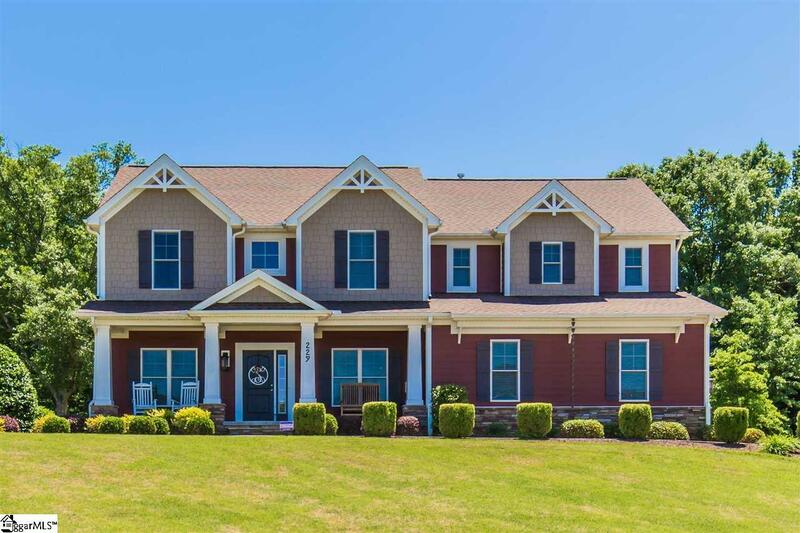 Located in a friendly community, enjoy the best of two worlds: Spartanburg low taxes and proximity to restaurants/shopping of Five Forks and Woodruff Road areas, and GSP airportyet so close to all that Greenville and Spartanburg have to offer. Be captured by its curb appeal, with its lovely well-manicured lawn and lush, mature landscape. The 4-bedroom, 2-1/2 bath residence is perfectly situated on a cul-de-sac, half acre+ lot. Follow the walkway to the rocking-chair porch. As you open the front door, enjoy the warm, bright and open 3000sq. ft. floor plan, with fan-shape staircase and oak hardwood floors throughout. Serenity and seclusion await on your custom patio with sitting walls, ready for morning coffee, family fun and grilling. Unique and custom features throughout Relax in your Family Room with custom stone gas log fireplace with stone hearth, Bose surround sound system, Blu-ray disk player and docking station (remaining). Walk into the Morning Room with french doors leading to the secluded patio. Enjoy adjacent formal Dining Room and cozy Living Room. Entertain in your Gourmet Kitchen with large center island, custom cabinetry, under cabinet lighting, and granite countertops. Mudroom/Drop Zone with laundry sink and Powder Room lie off Kitchen and lead to oversized double garage with custom cabinetry and workshop. Escape to the second-floor spacious Owners Retreat and ensuite bathroom, his/her vanities, custom tiled surround corner Jacuzzi aquatic whirlpool tub with built-in niche, custom tiled walk-in shower, large walk-in Master Closet. Three additional bedrooms share a large second bathroom with double vanities. An Office and large Laundry Room with custom cabinetry complete the second floor layout. Large closets and storage throughout. Other: One-owner home, 6 yrs. young. 9 ft. ceilings on first level with canned lighting. Neutral color and upgraded ceiling fans throughout. Exterior hardy board, brick and stone. Belgard paver patio with sitting walls, Belgard paver walkways. Exterior patio Bose Speakers. Front/Side/Back Irrigation System and Alarm System.